Gemba walks are becoming a very popular and effective way for facility management and other key areas to learn more about what goes on within the facility. Gemba, which simply means ‘the real place’ or ‘where the action is’ shows those who don’t normally do a specific task how it is being done. This knowledge can help them to come up with ideas and strategies for making improvements going forward. While Gemba walks can be used in any workplace, they are especially powerful in the manufacturing environment. This is because the ‘day to day’ jobs done by each area are often dramatically different from each other. In addition, the daily responsibilities of management are significantly different that he front line employees. This means that they need to learn a lot in order to be able to make the best decisions possible. 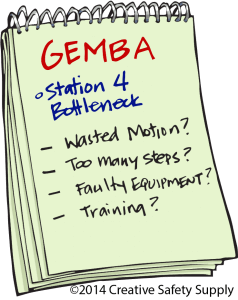 If you’ve never had a Gemba walk in your facility, it can be confusing on exactly what should be done. While every company will be unique, the following key points can be essential in having a successful event. One of the most important things you can do when planning a Gemba walk is to make sure everyone who will be involved or impacted is aware well ahead of time. This includes those who will be going on the walk as well as anyone working in the areas where the walk will go through. In fact, it is most important for the people in the areas where the walk is taking place to be aware that it is happening and what it means to them. It can be intimidating for many people to have a group of managers, supervisors and company leaders walking through their workplace, so taking steps to avoid misunderstandings can help improve the outcome of a walk. As with most facility improvement concepts, education will be essential. Taking some time to let everyone know what a Gemba walk is will help them to understand what is going to be taking place. It can also give them time to come up with questions or comments when it does come through. This is especially helpful when you are just starting the process of holding Gemba walks in your facility. Company Leaders – This can be anyone responsible for leading a company from the CEO on down. If the leaders don’t have a good idea of how work is done, they can’t guide the company effectively. Top leaders should typically go on a Gemba walk at least once per year. Managers/Supervisors – Department managers and supervisors should go on these walks as well. It is far too easy for these people to forget about how work is done, which makes it harder to provide the right guidance. Department and area managers should engage in Gemba walks both within their own area and through other areas of the facility as well. Safety Teams – Those who are responsible for the safety of the facility should definitely take Gemba walks. Getting a good understanding of what is going on in the facility will allow them to eliminate risks and improve safety in general. Other – There may be other key players in your facility. Identifying anyone who may benefit from the knowledge gained on a Gemba walk and inviting them to attend is an excellent idea. Another thing to consider when planning a Gemba walk is where it should start and how it should proceed. There are many options and no one set answer for every situation. In many cases it is good to begin your walk at the end of your value stream (where your completed product comes out). You can then follow the value stream up, which will give everyone a good idea of how and where the value is added. Starting from the end typically makes it easier for managers and others who are not a direct part of the manufacturing process to get a better visual understanding of what each step in the process is contributing. This is another important question, and one that will have a different answer based on your unique situation and who is involved. Upper management won’t need to go on these walks nearly as often as a direct supervisor. The easiest answer to this question is just to say as often as needed. In situations where people and processes are frequently updated, Gemba walks should take place more frequently. In areas where standards are fairly constant and the people involved in the company don’t change very much, they aren’t needed quite as frequently. General Understanding – If this is your first Gemba walk the goal will typically be just to get a good overall understanding of what takes place in the facility. By actually seeing the work take place, and interacting with those who do the work, you’ll get a more detailed knowledge than you possibly could by reading reports or hearing others explain the job. 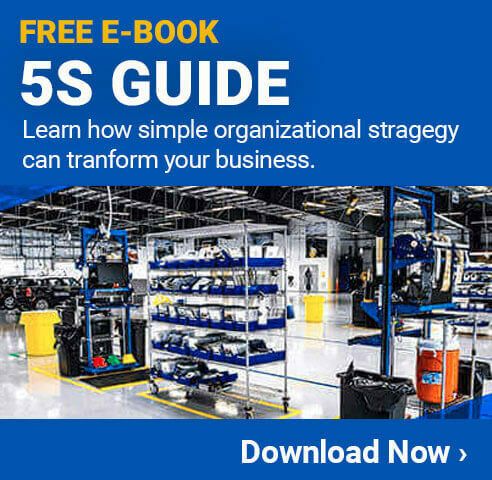 Implement Lean or 5S – If you are planning on beginning a lean or 5S implementation strategy, a Gemba walk will help you set a baseline of information from which you can build on. Identify Waste – You can identify where waste or inefficiencies are taking place within the facility much more easily on a Gemba walk than you can through reports. Safety Improvement – Safety managers can identify risks and other hazards immediately while on a Gemba walk. This should be a valuable aspect of any overall safety strategy for your facility. Many Gemba experts suggest having a ‘theme’ for each Gemba walk. Not only should the people going on the Gemba walk be focused on the specifics related to that theme, but those throughout the facility should as well. If you let front line workers know that a team is coming through working on improving safety, they will be able to show them concerns or talk about issues in this area that they face. When coming up with themes for your manufacturing Gemba walks you should make sure to not only have them set by the management team, but also ask the front line workers what things they would like to see addressed as a theme. Many people who have not participated in Gemba walks in the past wonder what the real point of them is. They can appear too many (especially those on the front line) that they are just a waste of time or a way for ‘management’ to get the front line employees in trouble. The reality is, Gemba walks are primarily a tool for information gathering. They should not be used to place blame on anyone or make immediate changes. Instead, a properly run Gemba walk will be the first step in coming up with ways to make improvements. It should give management the opportunity to learn about what the front line employees do, and also give the front line employees the ability to share their thoughts and ideas with the management team. Even when things don’t go as expected, however, there are always learning opportunities along the way. Engaging in regularly scheduled Gemba walks for your manufacturing facility will, over time, allow for significant improvements. One last point to make is that while Gemba walks are set up to facilitate improvements within your manufacturing facility, it is also important to work on improving the effectiveness of the Gemba walks themselves. After each walk is completed, you may want to take some time to review what the results were. Having a ‘Gemba Walk’ through your Gemba walk (so to speak) will allow you to see where things went well and where they can be improved. Make sure you gather information from those who were going on the walk as well as the front line employees in the areas where the walk took place. Over time this can lead to much more efficient and effective Gemba walks through your manufacturing facility which, of course, will lead to a more efficient and effective facility as a whole. 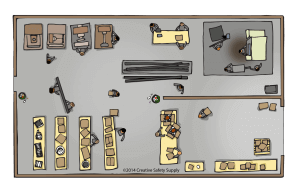 Make sure you check out Creative Safety Supply for all your 5s, Lean, and safety product needs.